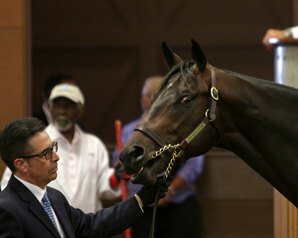 A son of Orb who was one of the buzz horses during the second session of Fasig-Tipton Midlantic’s 2-year-olds in training sale lived up to expectations when he was purchased by Dennis O’Neill, agent for Amr Zedan, for $710,000 on May 23. Consigned as Hip 373 by Crupi’s New Castle Farm, the colt bred in Kentucky by Susan Casner had been bought by agent Mike Ryan for $170,000 from the Four Star Sales group in the 2016 Fasig-Tipton Kentucky October yearling sale. The colt is out of the winning Cherokee Run mare Extra Sharp and his second dam, the Storm Cat mare Sharp Cat, won 15 of 22 starts, including seven grade 1 stakes, and earned more than $2 million. His stakes-winning third dam, In Neon (by Ack Ack), produced Royal Anthem, a group/grade 1 winner in England and the U.S. and a prominent sire. Dennis O’Neill, the agent whose keen eye for a 2-year-old has led to two Kentucky Derby Presented by Yum! Brands (G1) winners this decade, has high regard for Claiborne Farm stallion Orb, whose progeny have been in high demand at 2-year-olds in training sales this year. That was in reference to the Ashford Stud stallion whose first crop included Kentucky Derby winner Nyquist , purchased by O’Neill as a 2-year-old on behalf of Paul Reddam. O’Neill’s brother Doug trained Nyquist and Derby winner I’ll Have Another , also a Dennis O’Neill auction selection. 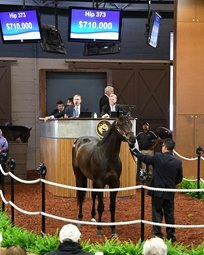 Orb, who stands for $25,000 at Claiborne, was represented by five juveniles sold at the Midlantic sale for gross receipts of $1,705,000 and an average price of $315,000. Consigned as Hip 373 by Crupi’s New Castle Farm, the colt was bought by O’Neill for Amr Zedan, who lives in Saudi Arabia, Dubai, and London, and races in Southern California. The colt is out of the winning Cherokee Run mare Extra Sharp. His second dam, the Storm Cat mare Sharp Cat, won 15 of 22 starts, including seven grade 1 stakes, and earned more than $2 million. His stakes-winning third dam, In Neon (by Ack Ack), produced Royal Anthem, a group/grade 1 winner in England and the United States, and a prominent sire. Bred in Kentucky by Susan Casner, the colt was purchased by agent Mike Ryan for $170,000 from the Four Star Sales group at the 2016 Fasig-Tipton Kentucky October yearling sale. At Tuesday’s sale, Ryan was underbidder on the colt on behalf of a different client than the one for whom he bought the colt last year. During the pre-sale under tack show, the colt breezed an eighth-mile in the co-fastest time of :10. “I thought his breeze was fantastic; his gallop out was great,” O’Neill said. “So we’re really excited. Another Orb colt sold Tuesday was Hip 468, consigned by Pike Racing and purchased for $525,000 by C. P. Beler, who was accompanied by trainer Leon Blusiewicz. Produced from the winning Dixie Union mare Julie from Dixie, the colt bred in Kentucky by E. H. Beau Lane III was bought from his breeder by Stallionaire Enterprises for $140,000 at the Keeneland September yearling sale.